Seagull Guitars have earned a reputation for uncompromising quality since the creation of the multi-award winning S6 in 1982. That momentum carries forward into 2017 with the aptly named Coastline Momentum. 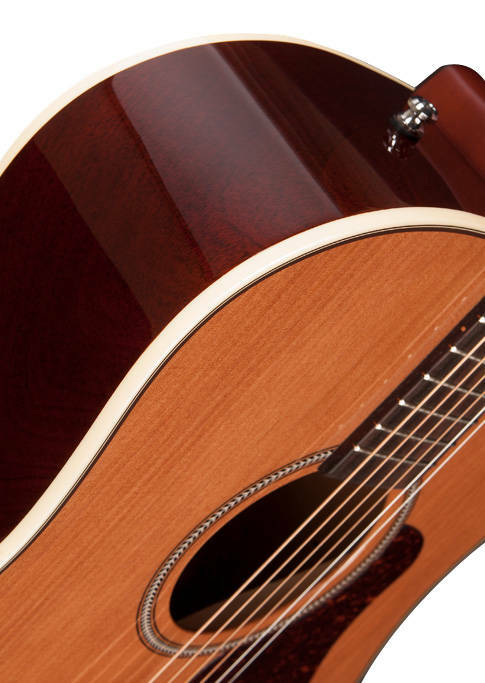 This hand-crafted guitar features an exceptionally thin High-Gloss Custom Polished finish that accentuates the pure natural beauty of the Wild Cherry back and sides, all the while allowing the solid Cedar top to vibrate freely. This luxurious yet affordable instrument features a smooth satin hand-finished Silver Leaf Maple neck, Adirondack Spruce bracing, Seagull's new High Ratio tuners, Fishman Sonitone electronics, Tusq nut and saddle and Rosewood fingerboard and bridge. Seagull can claim two of the finest guitars on the market; the Coastline Momentum & the beautiful Mini Jumbo, both finished in high gloss, high quality wood & workmanship; and my Wife & I own them both. And I put them comfortably against my Gibson & Martin, also high quality, excellent acoustic guitars.